A high end woodworking millwork firm was seeking to obtain financing to purchase the assets of the Company from its senior lender. The Company had been negatively impacted by a fire and fraud by a former partner and was experiencing tight liquidity. A very experienced Executive Coach and Turnaround Advisor was brought in to assist the Company. He put together a transaction to purchase the assets of the Company and raised $1.2 MM of equity to partially finance the transaction. The Company retained Concord as its exclusive financial advisor to arrange the debt financing portion of the transaction and identify a Bank that understood the Company’s business and objectives. 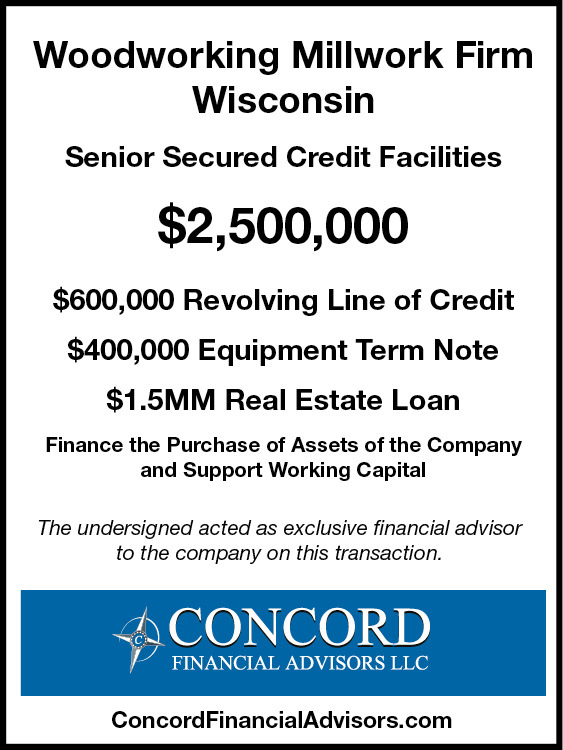 Concord quickly identified the most appropriate senior lenders for the Company and prepared a detailed memorandum summarizing the key aspects of the Company, coupled with setting up a data room with all pertinent information for select lenders. Concord conducted a targeted and efficient deal process with regional and national asset-based lenders along with a host of real estate lenders. Concord procured multiple competitive proposals for the transaction. The Company was able to achieve its objective of obtaining an attractive financing structure with a regional bank that can support its senior debt needs including a revolving credit facility, a term loan, and a real estate mortgage. The Company’s owner and management team were impressed with Concord’s proven process, the resulting financing structure, and the attractive economics of the transaction.